Natural and cultural are the words that best capture the essence of Romania, a dynamic country rich in history, art and scenic beauty. Romania offers the traveler countless unique travel experiences waiting to be discovered. A journey of just three to four hours, by car or train, can take you from the Danube River to beautiful, intact medieval towns in Transylvania; from Bucharest - Romania's capital city - to the Black Sea; from Southern Transylvania to Bucovina or to Maramures. Take a step back in time as you enter one of the world’s famous painted monasteries in Bucovina, the Sighisoara citadel or a centuries-old village in Maramures. Explore Romania's other architectural treasures and experience its vibrant and flourishing arts scene. Romania’s collection of castles and fortresses perhaps best illustrates the rich medieval heritage of the country. While castles built from the 14th to the 18th centuries are strong and austere fortresses built mainly for defense against invaders, those erected beginning in the late 1800s are imposing and luxurious. The most popular include the 14th century Corvinesti Castle, built on the site of a former Roman camp, the elegant 19th century Peles Castle with its 160 rooms filled with priceless European art and, of course, the Bran Castle, built in the mid-1300s and legendary home to Bram Stoker’s Count Dracula. Universal literature found valuable sources of inspiration in some of Romania's castles, with the most famous novels written about them being "The Castle from the Carpathians" by Jules Verne and "Dracula" by Bram Stoker. As a result of almost nine centuries of Saxon presence, Transylvania, located in central Romania, claims a cultural and architectural heritage unique in Europe. This region is home to nearly 200 Saxon villages, churches and fortifications built between the 13th and 15th centuries. Seven of the fortified Saxon churches (in Biertan, Calnic, Darjiu, Prejmer, Saschiz, Valea Viilor, and Viscri) were designated by UNESCO as World Heritage Sites. A visit to these quaint villages, placed amidst lush farmland and green rolling hills, will give you a taste of the long-gone medieval times. The mighty Danube River flows 1,788 miles from its springs in Germany’s Black Forest to the Black Sea. Just before reaching the sea it forms the second largest and best preserved of Europe's deltas: 2,200 square miles of rivers, canals, marshes, tree-fringed lakes and reed islands. The Danube Delta is a wildlife enthusiast’s (especially a bird watcher’s) paradise. Central Romania encompasses what is popularly known as Transylvania – a place that immediately brings to mind the legend of Count Dracula. 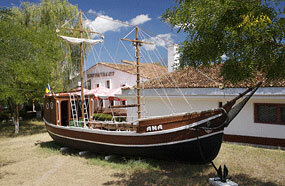 While the legend is certainly intriguing and a genuine tourist attraction, the region has much more to offer. Some of Europe’s best-preserved medieval towns, most notably Sighisoara, Brasov and Sibiu, are located here. Visitors can marvel at Transylvania’s unique architectural treasures, such as castles, fortified churches and centuries-old houses, while exploring sites where more than 900 years ago Saxon craftsmen and merchants established powerful and rich citadels. During the middle of the 12th century Saxons came to the area from the Luxembourg, Lorraine, Moselle, Rhine and Wallonia regions of northwestern Europe. Romania’s national and natural parks, displaying a unique variety of landscapes, vegetation and wildlife, protect some of the largest remaining areas of pristine forest in Europe. Grasslands, gorges, subterranean caves, volcanic lakes, and extensive river network add to the richness of the park system that also includes the Danube Delta, a UNESCO Biosphere Reserve and Europe’s largest wetland. The Oas – Harghita range in the Carpathian Mountains is the longest volcanic mountain chain in Europe. The 3500-year old Scarisoara glacier, located in the Bihor Mountains – 90 miles southwest of Cluj Napoca - has a volume of 2,649,000 cubic feet (75,000 cubic metres), making it the second largest European underground glacier, after the Eisriesenwelt ice cave in Austria. 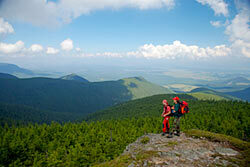 Romania’s diverse natural landscapes offer numerous choices for exciting outdoor experiences. Travelers can walk through serene alpine meadows covered with scores of wildflowers, trek around glacial lakes, take in the lush-green scenery while horse riding or mountain biking, climb curious rock formations, photograph fossil traces of 15,000-year old cave-bear species, track gold eagles or other rare birds, study endangered flora, wander in the countryside, picnic in the fields, try your hand at traditional crafts, - or just relax in the home of a village family and sample wholesome, country fare with home made wine and plum brandy. Deemed masterpieces of Byzantine art, these churches are one-of-a-kind architectural sites in Europe. Far from being merely wall decorations, the murals represent complete cycles of religious murals. The purpose of the frescoes was to make the story of the Bible and the lives of the most important Orthodox saints known to villagers by the use of images. Their outstanding composition, elegant outline and harmonious colors blend perfectly with the surrounding landscape. Visitors to the Painted Monasteries will often witness a nun or a monk beating a long beam with a mallet, tapping out a call to prayer. The tradition started during the siege of Moldova by the Ottoman Empire when the Turks forbade the ringing of bells. The striking of wooden or metal bars, known as toaca, replaced the ringing of bells and thus, became a tradition, reinforced by the fact that in times of war, bells were often melted down to make cannons. Whether you are interested in religion, history, art or architecture, you will be intrigued by the construction and decor — exterior and interior — of these edifices. The best-preserved are the monasteries in Humor, Moldovita, Patrauti, Probota, Suceava, Sucevita, and Voronet. Another, a small church, is located in the village of Arbore. Seven of the churches were placed on UNESCO’s World Heritage list in 1993. The eighth, Sucevita, is awaiting sanction to be added on the list. Started by Romans and unique in Europe. Today Romania's 70 natural spas provide relief for many medical disorders and illnesses including rheumatism, endocrine, kidney, liver, respiratory, heart, stomach and nervous diseases as well as nutrition, metabolism and gynecological disorders. Romania's main spas include: Mangalia, Neptun, Eforie Nord, Covasna, Slanic Moldova, Vatra Dornei, Borsec, Herculane, Buzias, Sovata, Bazna, Ocna Sibiului, Baile Felix, Tusnad, Calimanesti and Govora. The golden glow of the sun against the soft pastel houses; residents going about their business, tending the chickens, their vegetable gardens or sitting on the front porch can make an unforgettable scene. In villages and in the countryside, on lands dominated by ancestral castles, old fortresses and peaceful monasteries, life moves a little slower and follows ancient rhythms of tradition and culture. It’s not unusual to see a farmer bringing his fruits to the marketplace in a horse drawn wagon or to encounter a village festival where the locals perform ancient rites of planting and harvest dressed in colorful traditional costumes. Cold, pure well water beckons the thirsty traveler from the roadside. Men kiss women’s hands in a courtly greeting unchanged for hundreds of years. Lush vineyards, first planted by Dacians – ancient inhabitants of Romania, yield fine wines. In Transylvania, you will find villages clustered around ancient Saxon citadels, edifices that often enclose exquisite churches built by German settlers from the 12th to the 16th centuries. "The central characteristic of the Romanian cuisine is its great variety. It is a cuisine influenced by repeated waves of different cultures: the ancient Greeks, with whom Romanians traded; the Romans, who gave the country its name; the Saxons, who settled in southern Transylvania; the Turks, who for centuries dominated Romania; as well as Slavic and Magyar neighbors. All of these influences gradually blended into the varied and delicious Romanian culinary tradition"
Romania ’s climate and soil are hospitable to the production of many different types of wines, from dry, sparkling whites to rich, aromatic, purplish reds.